latest in graphics switching technology from NVIDIA. optimal battery life (up to 240 minutes). 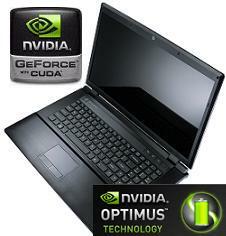 and comes with Intel Core i5 and Core i7 technology. 15.6" B5100M FOX and $1199 for 17.3" B7110 FOX model. power-saving with he integrated GPU only). Arrandale technology) for maximum power-saving. no longer needed to the operating system. enhanced performance it will let the integrated (iGPU) to handle. who prefer to set their own parameters for GPU usage.